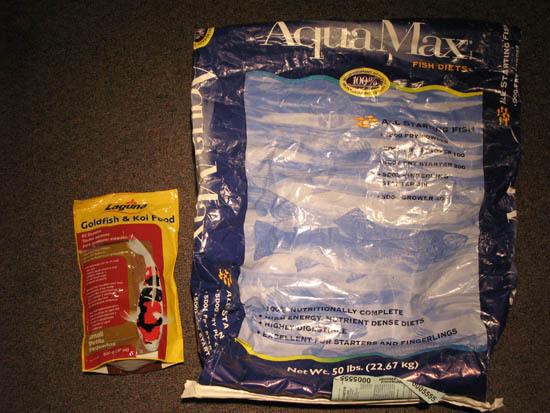 To feed the Koi, Goldfish and Tilapia we are mixing Purina Aqua Max fish chow with Goldfish and Koi food. We feed them one plastic bottlecap full (about a teaspoon) twice per day. So, two bottlecap fulls per day. We have 8 goldfish/koi and 7 tilapia. The AquaMax food is 50% protein and was given to us by a fish farmer who uses this to grow the Tilapia really fast. He pumps liguid oxygen into his system and feeding his fish 9 times a day to get maximum yield. We felt that twice a day feeding was well suiting to the amount of cleansing of the fish waste that our system could handle, though if you increase the number of 2 liter bottles potentially you could increase the number of fish and feed them more often. We notice that the Tilapia are growing at a good pace, though the Koi and Goldfish seem a bit fat so recently we have been using a mix of the Aqua Max and the Goldfish and Koi food to reduce the protein in their diets. The Goldfish and koi food has about a 33% protein content.